It’s time for the 2017 National Volunteer Month. In October, I will have been working with Greater Lansing Food Bank volunteers for 5 years. It’s funny to look back to 2012, when I stepped into this organization. GLFB already had a robust and dedicated volunteer base, many of whom had been giving their time for decades already. I had a lot to learn! Fast forward to today, and GLFB still has those folks coming to the warehouse, week in and week out, along with newer friends who have become part of the family. Throughout the years, there have been many changes, from a merger to new food safety regulations and changes in protocols, but the commitment among our volunteers has remained constant. One of the best parts of my job is to see people from all walks of life coming together. As one volunteer put it, GLFB hosts a real “salad bar” of cultures! We have retirees, working people, students, parents and single folks, businesses and organizations, all united in the fight against hunger in Mid-Michigan. Some give a lot of their time, and others give what they can. In 2016, volunteers donated 27,261 hours to the GLFB. Per the Independent Sector, that equals $642,269 worth of value to the food bank, which is just an incredible number. 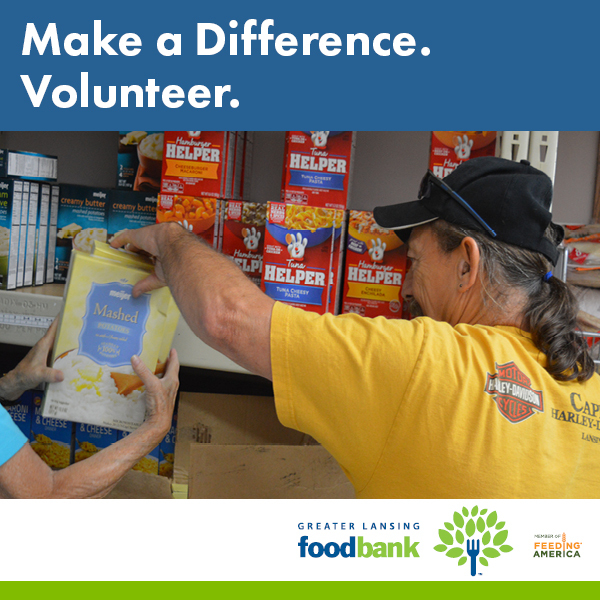 Volunteers make all the difference in the world for the Greater Lansing Food Bank. Without their support, donated food would literally sit at the warehouse. Apples ready for harvest would drop from the trees and rot. Community garden spaces would become neighborhood blights, and some of our biggest fundraisers wouldn’t even get off the ground. Every time I put out a call for more help, our supporters respond in droves. Thank you seems like an insufficient way to express our gratitude for such dedication. Did we mention our volunteers are also super smart? According to our recent Volunteer Engagement Survey, 97.5% of volunteers throughout our programs feel that they are able to make a difference in the greater Lansing area by volunteering at the GLFB. April 23rd through 30th is National Volunteer Appreciation Week, and we would like to thank each and every person who stepped up to give their time throughout the year. You all HAVE made a difference to help food insecure people – seniors, children and working families that live in and around our neighborhoods. From all of us at the GLFB – Thank You. This entry was tagged Greater Lansing Food Bank, Michigan Charity, mid-Michigan, national volunteer month, Volunteering. Bookmark the permalink.